Our 25 strong youth team who train and play in year groups from S1 to S2 (U13 to U14) are catered for here. This group has a dedicated 2 man coaching team (Bob & JP) who work with our Duke of Edinburgh volunteers from local schools. 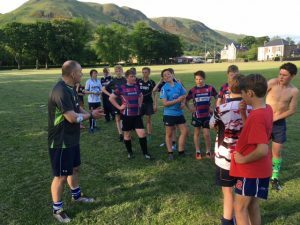 The usual Hillfoots principles and values apply – “everybody plays”, so there’s plenty of game time and healthy competition for all. There are also weekly prizes for the those who put in the most effort, growth mindset attitude and sensational skill (Techers), not just results on the pitch. At Hillfoots, we appreciate that some boys may also be playing for their school as well as their club at this age group. We encourage everybody, whether or not Hillfoots is their only rugby during the week, but we are also concious not to over stress players. We like to fit in with, and be complimentary to, our players’ other rugby commitments. We have an ongoing dialogue with local secondary schools (such as Alva Academy, Dollar Academy & Lornshill Academy) to ensure that there is no conflict between club and school rugby. In our youth section, we follow the SRU age grade law variations, so there are specific modes of play for both S1 & S2. We continue to focus upon building individual skills as well as increasingly developing the team play and by S2, the boys are starting to master their game winning strategies. At S1, there are 13 players in a team (6 forwards & 7 backs). Kicking at goal appears for the first time (for 1 point) and conversions can be attempted no wider than the 15m line. The scrums are contested with a 3:2:1 formation, albeit the No.8 cannot pick up & run. The winning scrum half must also pass out along the backs. Line outs are contested. There are also some special kicking rules in open play as well as law variations governing how quickly the ball must emerge from rucks & mauls. At S2, there are 15 players (8 forwards & 7 backs). Match times are 10 minutes longer than in S1 (S2: 2 x 25 minutes). To regularly measure “in season” player progress, the coaches & our Development Officer use individual player assessment tools. These are the same tools as the SRU use in selection for their Caledonia Pathway programme. Not only does this approach give excellent feedback to players, it also enables the Club to make supportable recommendations to the SRU in respect of their Performance Camps which take place in the Spring & Summer of each year. Our coaching team are also able to make recommendations on individual player fitness levels, lifestyle, well being & nutrition. At this level, very light gym work (under a supervised programme created by the Club’s Strength & Conditioning Coach) is recommended as a supplement to general rugby training. The S1/S2 team is one of the most important in the club. This is the age group when we introduce boys and girls to a more physical side of rugby and when we develop their skills to enable them to play at a higher and more competitive level. The focus is very much on skills and technique, and on coaching the spirit of rugby. By spirit we mean discipline, respect for referees, encouragement of fellow players, and putting the team above the individual. 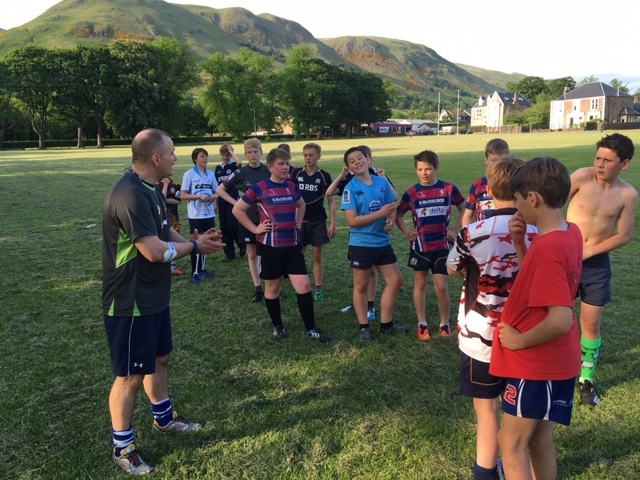 We coach passing, awareness of space, proper tackling technique and also specific skills like line-out and scrums. The aim is to provide the boys with the skills and self-discipline to allow them to progress to the maximum extent of their ability and desire. We are fortunate to have a large pool of coaches and so we are able to spend time with individuals giving 1-1 coaching.